For the first installment of our Staff Spotlight series, we sit down with Public Services Assistant Taja Jones to learn about her roles at PHS and what makes her tick. I draft letters for the Reference Archivists and retrieve materials for visiting researchers. I also conduct many of the Genealogy Research Service requests and manage the Facebook page. I’m a native Philadelphian and avid concertgoer (I’m halfway through my goal of attending 100 concerts by my 30th birthday). In the spring of 2013, I graduated from Penn, where I studied Anthropology and Religious Studies. Before I started at PHS, I was a Research Assistant in the Archives of the University of Pennsylvania Museum of Archaeology and Anthropology. Aside from being a lover of all things related to history, music and culture, I have recently discovered the art of sewing and have been spending my free time enjoying my newfound hobby. 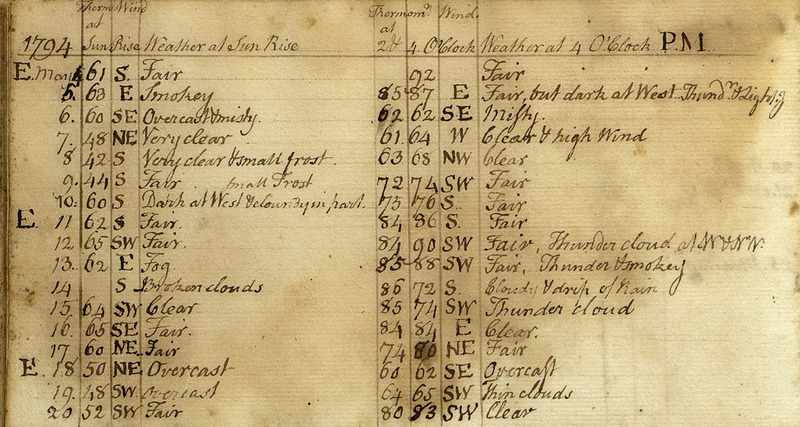 James Madison’s weather journal. It still amazes me that we have an item that was once used by a former president and founding father—and he wasn’t even Presbyterian! Other than the Genealogy Research Service, which started right before you began working here, how has PHS changed since December 2013? One area is our social media presence—not just with Facebook, but with our new Twitter and Instagram feeds! It’s exciting to see these great changes in such a short amount of time. I can’t wait to see what the future has in store. Continuing to work and grow in the historical and museum fields. A lot of your day is spent finding items for patrons. What’s your own favorite book and movie? Of all the fantastic books that I have read over the years, I can’t pick one favorite but I am currently enjoying the A Song of Fire and Ice series by George R.R. Martin. Martin is an incredible author who has created such an exciting group of characters and stories. I can’t wait to finish the book series so I can start watching the TV show! Quite surprisingly, my favorite movie is, Die Hard with a Vengeance. When I was younger, my sister and I would watch it over and over again, now we can (and often do) quote entire scenes from the movie. I’m great at recognizing voices. Whether it’s an actor doing a voice over on a commercial or an artist singing a song that I’ve never heard before, I can name them. If you could invite three famous people, living or dead, to a dinner party who would you invite and why? Eva Peron: I was introduced to her story at the age of six when I watched the film adaptation of Evita, the musical based on her life. Her story, although controversial to some, is undeniably inspiring and it would be incredible to speak with the feminist trailblazer who inspired my favorite musical. Michelle Obama: I have long admired the First Lady as a woman, mother, and leader. She is a wonderful role model whose dedication to her family and this country amazes me. Plus, having her at my dinner party would mean that I could pick her brain for fashion advice! John Lennon: Lennon is one of the most amazing songwriters there ever was! His solo work, along with the work he did with the Beatles, has influenced many of my favorite artists and it would be awesome to have the opportunity to speak with him about the evolution of music since his death in 1980.